It’s more than just a box. Includes the recycling container, shipping to a certified recycling center, recycling charges, and a certificate of recycling, all for one low fee! Holds up to 150 "small" compact fluorescent lamps (CFLs), 525 2-pin, 265 4-pin, or 125 incandescents. Each container comes with the recycling box, a poly liner, tie, instructions, terms & conditions, and a pre-paid return shipping label. Access exclusive online features including recycling reports, container tracking, and certificates of recycling. Only sold in the United States. Not available in Alaska, Hawaii, Maine, or Puerto Rico. Order as many containers as you need for your facility. The more you buy, the more you save! 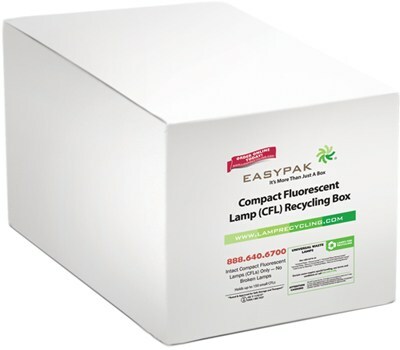 The EasyPak™ containers will be shipped to you with a return shipping label to the recycling facility and instructions. Fill the container with lamps. Once the container is full, seal it and ship the container to the recycling facility for processing. It's that simple! Minimize storage - when it's full, ship it, it's pre-paid. Simplify paperwork - no complicated, expensive manifests. One order can provide recycling services for an entire year. Customer service representatives are available to assist you. Reduces the administrative burden while retaining control of disposal. Easy ordering process. Either order here at www.lamprecycling.com or call toll-free 888.640.6700. Easy to follow instructions, complete with illustrations that are printed on the box in English and Spanish. Minimizes the chance of facility contamination by reducing on-site storage and subsequent accidental breakage and/or leakage. It was easy to order and use and love that return shipping is included in the price. Box comes clearly labeled with easy return instructions. Quick, easy, convenient. Thank you for your time! We value all feedback provided by our customers, and read every review. What did you like about the product? What did you dislike about the product? Comments, suggestions, improvements or stories to share? On a scale of 0 to 10 (0 being not at all likely, 10 being extremely likely) how likely are you to recommend Lamp Recycling to a friend or colleague?